The Basilica of Santa Maria degli Angeli stands in the plain laying at the feet of the hills of Assisi protecting the Porziuncola, where San Francesco is said to have founded the first group of the Order of the "Frati Minori" (Minor Friars) in 1209, and the Chapel of the "Transito" where the saint died on October 3rd 1226. The church was realized on the order of Pope Pio V in 110 years starting from 1569 after Christ, following the project of the architect Galeazzo Alessi and with the advices, among others, of Vignola; the edifice is nowadays one of the largest sanctuaries of the Christian world, being 126 meters long, more or less 65 meters large and 75 meters high at the level of the cupola achieved in 1680. 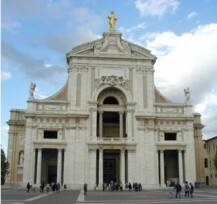 The actual aspect of the church of Santa Maria degli Angeli is due to the variations made during the building for the realization of the belfry around the end of the 18th century, but also to the interventions of 1832, made necessary after an earthquake, and to the rebuilding of the façade on the project of Cesare Bazzani between 1924 and 1930. In 1930 is also positioned on the top of the façade the statue of the "Madonna degli Angeli" (Madonna of the Angels) realized by the sculptor Colasanti, while, for the achievement of the place in front of the Cathedral in such a way that it can still be admired nowadays, we have to wait for the project of the architect Nicolosi in 1950. The architectonic structure of the internal part of the church is made of three bays in neoclassical Doric style due to the interventions of L.Poletti after the earthquake of 1832; the apses that, according to the original projects should have had a square plan, has nowadays a semi circular form and holds a precious choirs dating back to the end of the 18th century and the papal altar of the architect Apoloni Ghetti with sculptures of E.Manfredini. The basilica welcomes some of the frescoes of F.Appiani dating from 1757 and in the chapels paintings from the 17th century of Pomarancio, Giorgetti, Sermei Salimbeni and pf the Zuccari brothers.